Charmingly Chocolate. Try some sweet summer sensations before it's too late. The summer is almost over and that's a good enough reason to splurge. Let's splurge together! Hi! I hope your 4th of July gathering last month was a great success. I notice some of you ordered the software to design your own candy bar wrappers that I recommended. I do hope you will take a few minutes and send me a photo of your clever party favor when you get a chance. I want to show it off! I had a lovely visit with my family during July. Most of you know that my husband and I are serving as missionaries in Australia. I love it, but I do miss my family. I was blessed with a trip "home" to see them all. It was wonderful. To top it all off, they threw me a surprise 40th birthday party! Yes, I am getting that old! My birthday isn't until the end of August, but they wanted to spoil me while they had the chance. I laughingly complained that now I have to be 40 longer than everyone else. I enjoyed their love and thoughtfulness so very much. "I started looking on line for an easy and easy-to-please cake. I found a pretty simple one on Kraftfoods.com, they even had a template you could use to cut your cake. Our printer is on the blitz, but I found it pretty easy to make my own following their example." "I used a regular 9x13 pan and cake mix for the cake. I cut out the pieces and then placed them together and used toothpicks as nails to hold them together." "I spread chocolate icing over the whole cake. 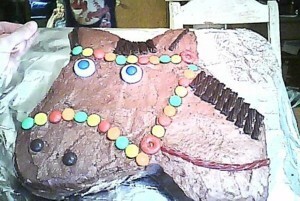 I used licorice (cherry and chocolate) for the reins and mane. M&M chocolates and lifesavers made up the bridle, and 2 white lifesavers with M&M's were the eyes." 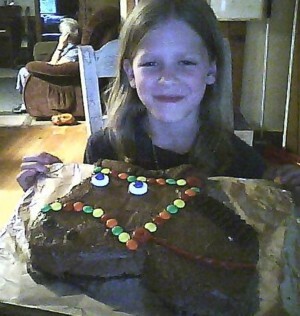 "Angela really liked her horse cake and so did the brothers and sisters because not only did they have cake and ice cream, there was enough candies on the cake for everyone to get some!" My dear friend, Susan, here in Australia (also an ex-pat) gave me this wacky chocolate cake recipe to share with you. She had the nerve to make it when she new I was coming over to visit. How can a girl be expected to resist such temptation??? Here's the recipe so you can try it yourself before summer is over. Lightly grease an 8” (20cm) square cake pan with butter. Pre-Heat the oven to 150 degrees centigrade. Pour 1 – 1 ½ cups of cold water over the whole mixture. Stir together carefully and thoroughly with a fork. Don't beat it hard. Pour into prepared pan. Bake at 350°F (150°C) for about 45 minutes. Test to see if it is done and bake a little longer if not (a tooth pick thrust in to the centre should come out clean, or if the sides have pulled away from the pan it is done). Ice with chocolate butter icing - you can flavour it with vanilla or peppermint. Splurge On Gourmet Chocolates With Me! The end of summer is as good an excuse as any to indulge a bit in some really special treats. I thought you might like to join me. You'll find plenty of recipes and gift ideas throughout the site. What are you waiting for? With the economy being the way it is, I always want to take a moment to pass on this bit of information to any of you who have been thinking about the whole idea of working at home this year to make a little extra cash. I'm more amazed than anyone that I have been able to build Chocolate Candy Mall. It's been a challenge and a thrill to take it on and succeed. The company I used to teach me the ropes about building an online business is Sitesell. Their tools and step by step training are really remarkable. But, I won't go on and on about it. 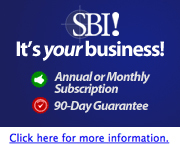 For those with an interest in giving the concept of building an online business a chance, you won't do better than SBI. Also, if any of you are involved with or have an interest in network marketing, I'd like to suggest two resources that, I believe, would be a tremendous help to you. The first is some tips on how to turn network marketing into internetwork marketing. The second is an inspiring free book called The Seven Great Lies of Network Marketing. I'd be happy to discuss either of them with you if you like. Feel free to send me a note. I'll be glad to help out any way I can. Enjoy your sweet summer sensations! I hope you do take a little time to indulge! Even if you don't want to go all out and order some special chocolate online, make something special yourself using one of the recipes at Chocolate Candy Mall. I'm sure there's someone you can get to indulge with you!